Alice in Winterland is coming to The Gladstone Theatre December 28th to January 7th 2018. The creators of Freezing and The Blizzard of Oz are back with their 4th annual holiday panto! 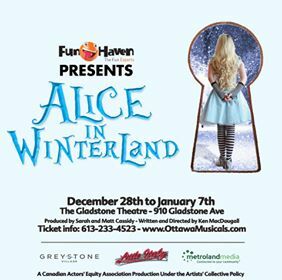 Alice in Winterland is coming to The Gladstone Theatre December 28th to January 7th. It’s the classic Alice we all know and love, with a wintry twist. Come join her down the rabbit hole and witness the Gladstone transform into a winter wonderland.